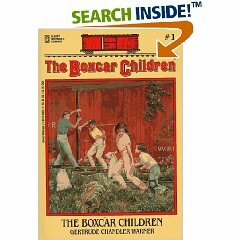 The Boxcar Children: Remember Them? Vivienne and I just finished reading aloud the first of The Boxcar Children series. Vivienne adored the drama of four children trying to escape from the selfish bakers, the adventure of building a swimming pool, and the intensity of Violet’s illness (of course). I loved the way the children spoke so kindly to each other, looked out for one another, worked diligently, and enhanced Vivienne’s make-believe: now, she knows how to set up a home with her little wagon, a trip to “the dump”, a handful of black walnuts, and a shovel. If you’re in the market for one, this is a top recommendation for a preschool read-aloud.